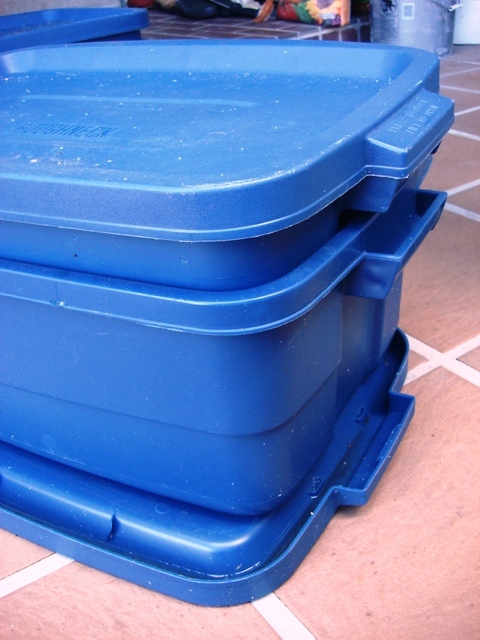 This container houses our worms. Red Wigglers (Eisenia fetida) to be exact. 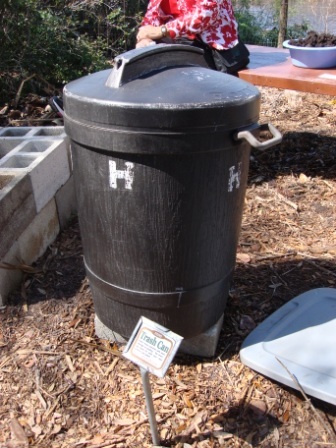 The worms eat our garbage and turn it into black gold. 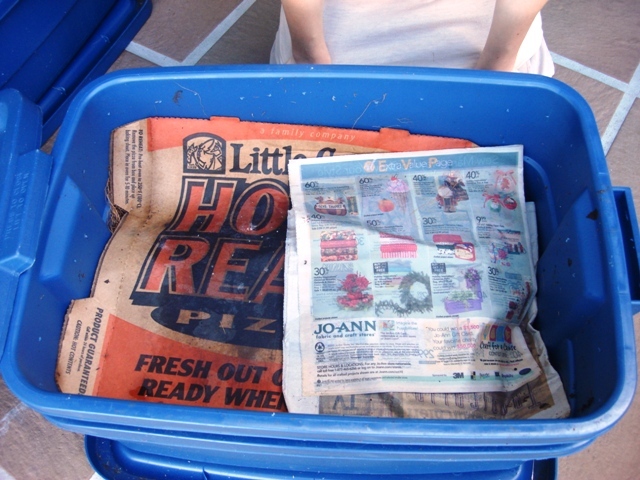 I used to buy the worm castings (for compost) in bags and I paid a pretty penny for them. When I realized I could easily keep my own worms and have my own castings, I ordered a Can-O-Worms. I couldn’t get it fast enough, even though I had no idea what to expect from keeping my own worms. 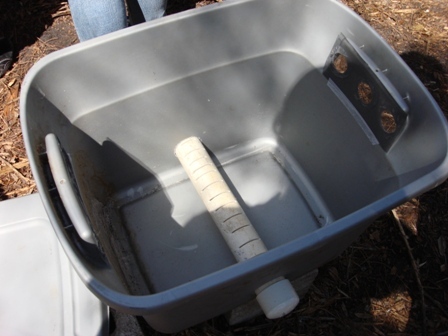 Red wigglers are kept in a bin because they need soil that is extremely high in organic matter, unlike most gardens and lawns. 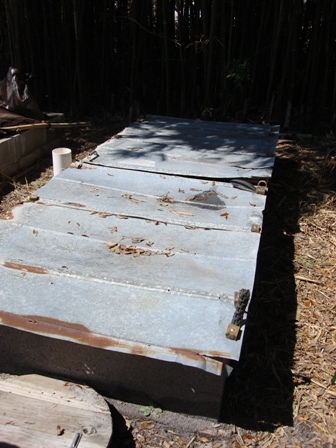 It is not likely that the worms would survive unless your garden is very rich in organic matter. 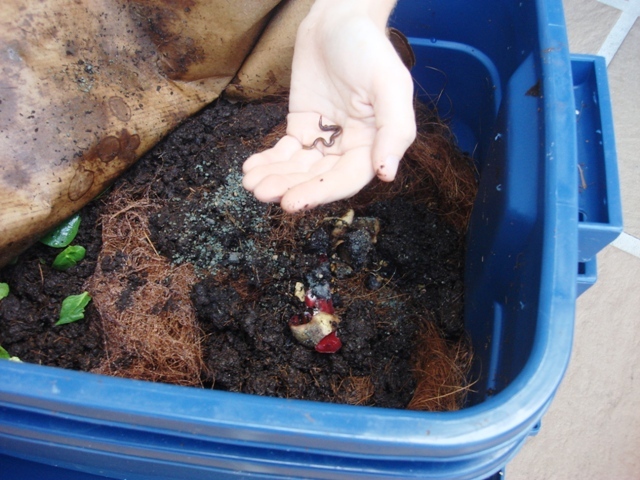 There are hundreds of different species of earthworm, but the Eisenia is an excellent choice for vermicomposting. I’ve had my worm bin filled with worms for two years now. I haven’t had a single problem and I’ve found them to be extremely easy to take care of. 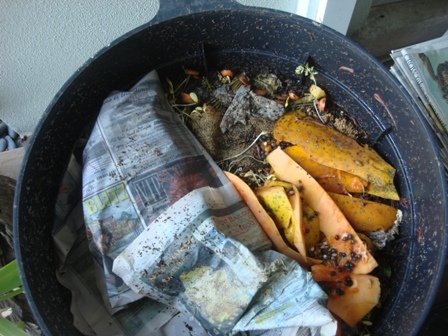 I take our kitchen scraps such as paper,coffee grounds, tea bags, old rice, pasta, melon rinds, pizza crusts, crushed eggshells, old bread and feed it to the worms. 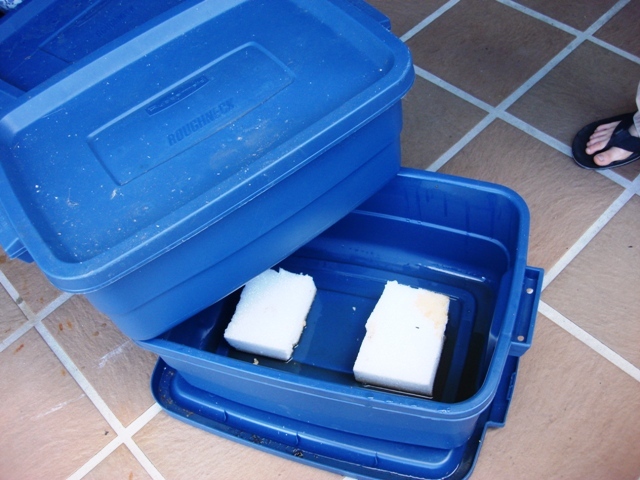 I place the scraps under a thin cover of newspaper under the top lid on the bin. Sometimes I don’t feed them for 2-3 weeks, but they always have something in there to eat. They take longer to consume some scraps that I put in the bin. It is recommended that you chop up the scraps. I admit that I rarely do that. They have no trouble eating their way through the larger stuff. They absolutely adore watermelon rind. I just set the whole rind flesh side down and every worm in the bin will hastily go right to it. They won’t leave that rind until it is gone. I ordered the Can-O-Worms because it was the easiest for me at the time and I really like the design, especially the spigot at the bottom. 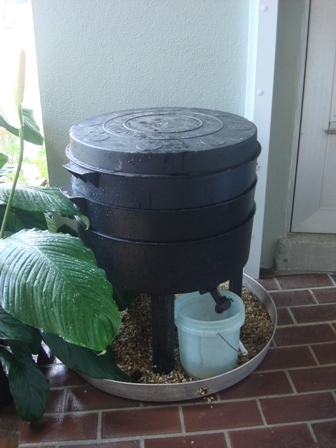 I keep the spigot open and I get worm tea daily. 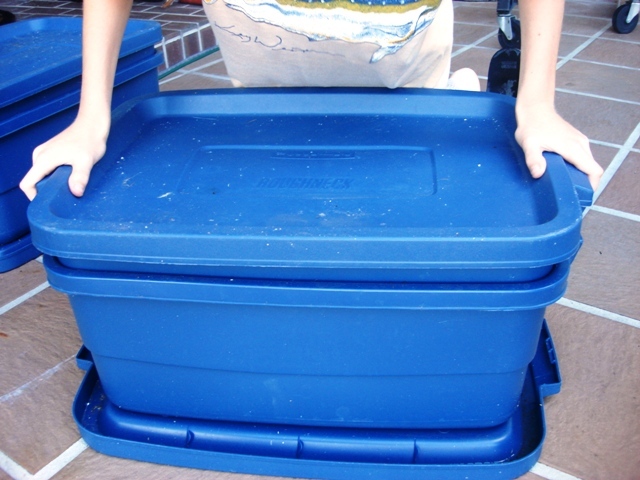 However, any container can be turned into a worm bin. It must conserve moisture and provide total darkness for the worms. 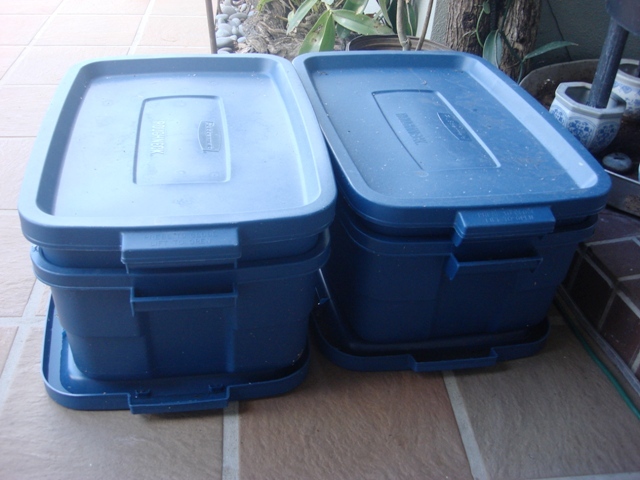 Some people even keep their worm bins inside their homes. My husband politely asked me to put ours outside. 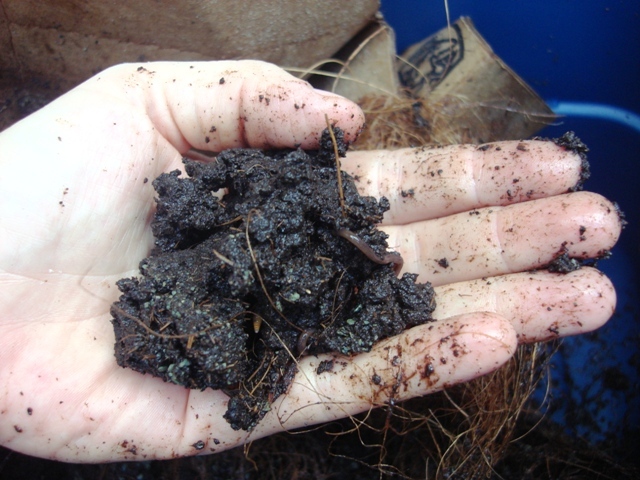 Worm castings are considered “black gold” because it’s superior over ordinary compost. The nutrients in the castings have a time-release quality that is stable and available to plants for over five years when added to the soil. It will not burn your plants so it can be added to the soil any way you choose. 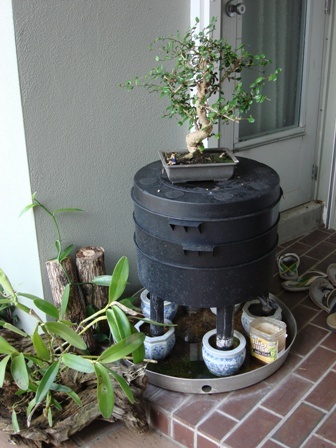 The castings can act as a hormone to give your plants a boost. If you were to get really hungry, earthworms are nutritious. I have a book that has quite a few recipes for cooking with earthworms. This book, called “The Worm Book” by Loren Nancarrow and Janet Hogan Taylor is the best book I have found for all the information needed to set up and keep worms. The book also goes in-depth about worm biology, the different types of worms, starting and maintaining a bin, troubleshooting problems, cool facts, and of course…the recipes. Another good book is “Worms Eat My Garbage” by Mary Appelhof. 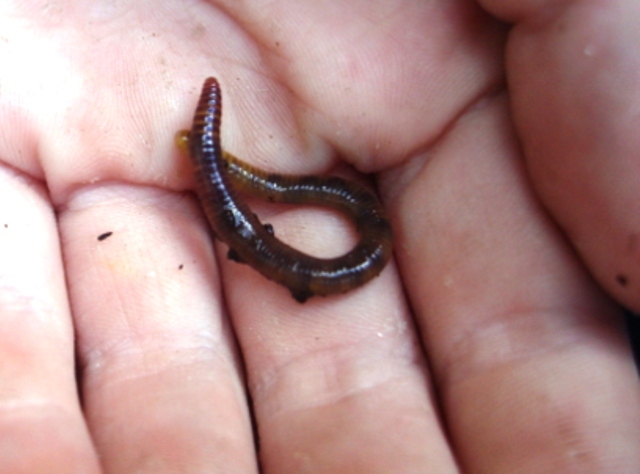 There is a great blog on worms called “Monster Worms“. We enjoy our worms and we’re always proud to show them off. They have been a very educational experience for my children. They are safe for the children to handle and have no smell. 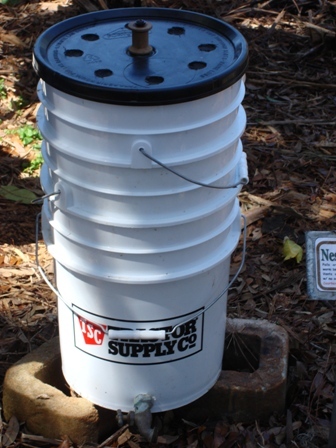 We love that the worms recycle our garbage into wonderful, nutrient dense compost. 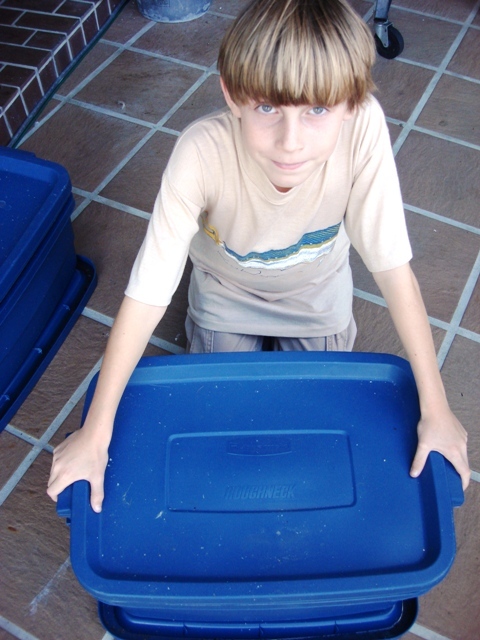 Recycle…garbage…landfills. I believe these worms are going to play a huge part in our planet’s future.